Have you ever wondered how others perceive you? If you could ask them how to improve your reputation, what would they say? How you think others perceive you is not always reality. Many professionals believe they’re doing a great job selling themselves. 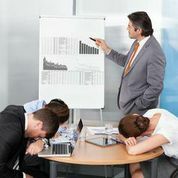 They polish their presentation skills, practice better eye contact and even work on better body language, yet they fail to realize that the hidden mistakes they make erode their credibility. Others’ perceptions aren’t based on who we are but are rather an observation of how we are day-to-day. It happens. No matter how much we plan, the day will come when time isn’t on our side. It’s even harder to deal with tardiness when you’re known for being punctual. You know how bad it looks to others, which amps up your stress and emotional guilt even more. This is no excuse to burst into a meeting and announce upon arrival that you are late. No matter the excuse – a meeting ran long, traffic was terrible or your alarm clock failed you – it doesn’t matter. You’re late. End of story. Don’t add insult to injury by reminding everyone. Fix-it Tip: Acknowledge that this is not a habit but rather a one-time misfortune. Ease your inner guilt and calm down. Get your paperwork, gadgets and supplies prepared so you look collected as you enter the room. Be quiet and take your seat. If you run late because you overslept, don’t show up looking like a frazzled mess. Ensure your attire and grooming are clean and tidy. No one needs to see your bed head and wrinkled clothes. 2. Texting Under the Table. You’re not fooling anyone. Everyone notices when you text under the table during a meeting. When your attention is on your smartphone, everything about your body language changes. Your posture slumps, your head drops, your eyes appear closed and your hands go missing. No matter how effective you are at simultaneously listening and texting, you aren’t. You may think you’re being sneaky by keeping your device out of sight, but what you’re being is disrespectful to others in the room – especially to those speaking. Fix-it Tip: Avoid temptation. Leave your device in your office so you aren’t tempted to look at it. If that’s not an option, turn it on silent and put it somewhere out of sight. Keep it off the table so others can’t see your incoming calls and messages. It’s only out of mind when it’s out of sight. 3. Head and Eyes Up. Our society has become overly present with technology and absent-minded to those sharing our space. Walking and texting is not like walking and chewing gum. The two cannot be done simultaneously without causing harm. We’ve all laughed at the funny videos of people walking into poles or tripping because they weren’t paying attention. Now, consider how that goes over with your co-workers attempting to avoid being your next unintended victim in the hallway. Fix-it Tip: Until we are gifted with eyes on top of our head, put the phone down and watch where you’re going. Wait until you have a moment to step aside and answer the incoming message. Avoid the temptation to check it en route. Instead, make meaningful eye contact with peers. Greet others and be intentional in your interactions. It’s easier to build positive influence by saying “good morning” rather than knocking someone to the floor. No matter where we go, someone is always watching. We are continually being observed – whether by a camera overhead or a person sitting across from us in a parking lot. Being unaware of surroundings will cost you credibility. The car is not the place to do your makeup, dance or change clothes. Your office is not the place to pick your teeth or your nose. When walking into work, limit the number of bags you carry. Confidence isn’t carried by a pack mule. Fix-it Tip: Recognize that the moment you pull into a parking lot, you’re being watched. Even when you think you’re alone, you’re not. If there are grooming matters to attend to, handle them before you arrive. If that’s not possible, head to the nearest restroom. Be aware of what you look like walking into the office. Maintain strong posture and stride. Keep your head and eyes up, remaining aware of your surroundings. Consolidate your belongings into one professional tote. You’re not moving; you’re only going to work. 5. Stop the Blame Game. Company culture is not a reason to excuse poor habits. Just because your peers are guilty of doing the same doesn’t mean you get a free pass. No matter how fast-paced or easygoing your company culture may be, your bad habits are sending a message of laziness and disrespect. Even when those in leadership roles set a bad example, you don’t have permission to do the same. If you fail to correct your bad habits, people will question your authenticity. They will see a disconnect in the person you really are versus that which you want them to see. Fix-it Tip: Raise your bar and others will follow. As you uncover your hidden mistakes, you’ll see them in others as well. Ask for feedback from someone you trust. Get to know how others perceive you and the bad habits you might not know you’re making. Seek an accountability partner. Once you’ve identified what needs to change, make a peer commitment to stop. Meet with them regularly to discuss your progress or setbacks.